Learning how to make macaroni and cheese can be as simple as cooking the pasta and adding a little cheese. When flavored with butter, salt and pepper, this is quite good. The shape of the macaroni usually does not make a difference except perhaps a little difference in the cooking time. It can be elbow, shells, long or short tubular shapes. 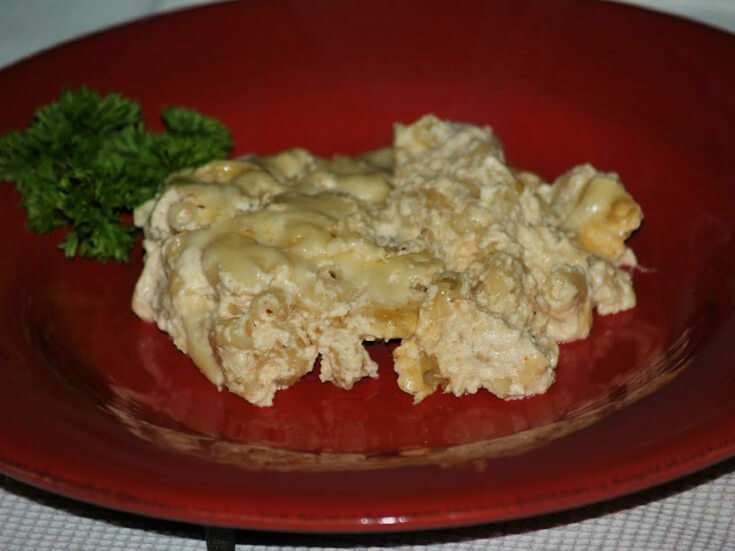 Most of the time macaroni and cheese recipes start with a roux made into thick creamy sauces. These sauces can include many different seasoning ingredients. When adding various seasoned sauces to cooked macaroni, many different recipes can be made. This very popular “comfort food” has been around since the thirteenth or fourteenth century. It has always been considered delicious, convenient and pretty cheap to make. In early times the wheat was very cheap so making macaroni was economical. For these reasons everyone was learning how to make macaroni and cheese. Also for these reasons, the Kraft Company created macaroni and cheese in the box. In 1937 the “blue box” of macaroni with dried cheese appeared on the market in the United States and in Canada. Mom knew very well how to make macaroni and cheese home style. Mom tried the boxed type around 1957 and found it very convenient and pretty cheap. This is the only prepackaged food I can remember being in our kitchen. The Kraft “blue box” contained a measured amount of dried macaroni and a package of dried Cheddar cheese. The powdered cheese in the box was much cheaper than keeping fresh cheese on hand all the time. Mom would add milk, butter, salt and pepper. This product had a long shelf life and Mom found it more convenient than trying to keep fresh cheese on hand. Although I never use it now, I remember it as being very tasty and it was on our table for lunch on a regular basis when my dad came in to eat. If you are trying to learn how to make macaroni and cheese, it can be made on the stove top or baked in the oven. As I said before, macaroni and cheese can be made with only a few cheaper ingredients or with more expensive cheeses, creams, peppers, meats, herbs and spices. These can also be topped with bread or cracker crumbs and butter for extra flavor before baking. When you learn how to make macaroni and cheese, you will find it also very popular in other countries. Those recipes will utilize their own local ingredients like cheeses, herbs and local vegetables and sometimes meats. Here in the UNITED STATES Cheddar cheese is the most commonly used but very often cheeses from around the world are added. Sometimes we also add vegetables like onion, garlic, tomatoes, bell peppers, an assortment of chopped meats and various herbs. FRANCE has a lot of delicious cheeses; many we do not have access to. Some of these cheeses produce flavorful, creamy smooth macaroni and cheese recipes. You will find a variety of pasta shapes like the long tubular used in French recipes. The ITALIANS also have their own locally made cheese. Ones like ricotta, provolone and mozzarella along with tomatoes, herbs and other ingredients add traditional Italian flavor to macaroni and cheese dishes. Instead of using elbow macaroni like we do, shell macaroni is commonly used in Italy. The GREEK people also love macaroni and cheese. Common ingredients which are used in much of their cooking can be found in the macaroni and cheese recipes; tomatoes, spinach, olives, feta cheese, thyme, garlic and yogurt. CANADIANS really love macaroni and cheese, the reason Kraft chose to distribute their Mac and Cheese Dinners. 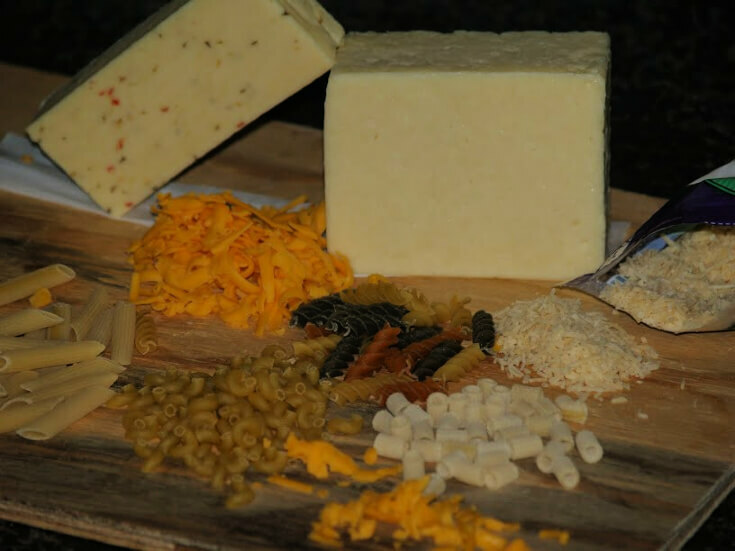 Cheddar cheese is most commonly used along with other locally available cheese. It is common also for recipes to include tomatoes, Canadian bacon and many of same ingredients which we use. Learn how to make macaroni and cheese like President Reagan like it. I have several copies of this recipe all saying it is the president’s favorite so I am assuming it is correct. Stir 1 teaspoon butter and egg into cooked macaroni. Mix mustard and salt with hot water; stir in the milk. Stir 2 ½ CUPS of the cheese into hot macaroni. 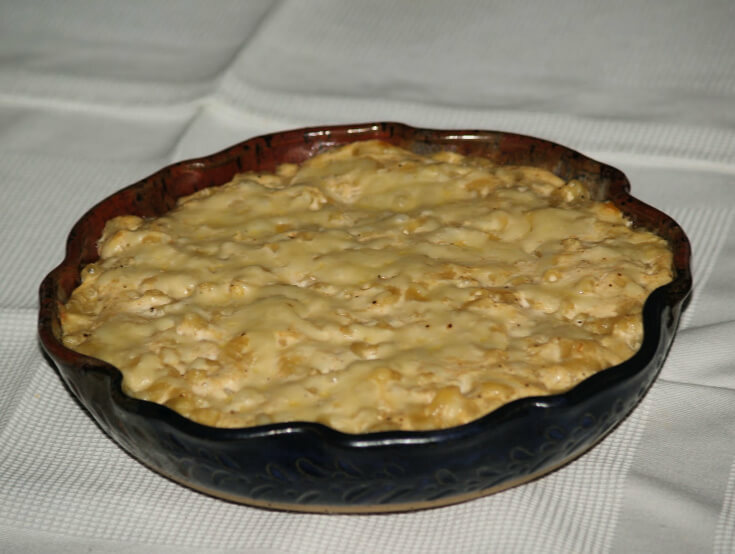 Dump macaroni into 1 ½ quart buttered baking dish. Stir the milk mixture into the macaroni. Sprinkle top with remaining ½ CUP cheese. Top with bread crumbs; dot with 1 Tablespoon butter. Bake uncovered about 45 minutes (Top should be crusty). Learn how to make macaroni and cheese with sour cream, cottage cheese. Preheat oven to 375F degrees; butter a one and half quarts casserole baking dish. Combine cooked macaroni, butter, sour cream, beaten egg and ½ CUP of the Swiss. Stir in paprika, salt and pepper; dump into prepared baking dish. Sprinkle top with remaining ½ CUP of Swiss cheese; bake 30 minutes. Learn how to make macaroni and cheese with this basic sauce; use on all kinds of pasta, potatoes, etc. Melt butter in top of double boiler; blend in flour until smooth. Gradually stir in the milk; continue stirring until thickened. Add salt, pepper and cheese stirring constantly until blended. 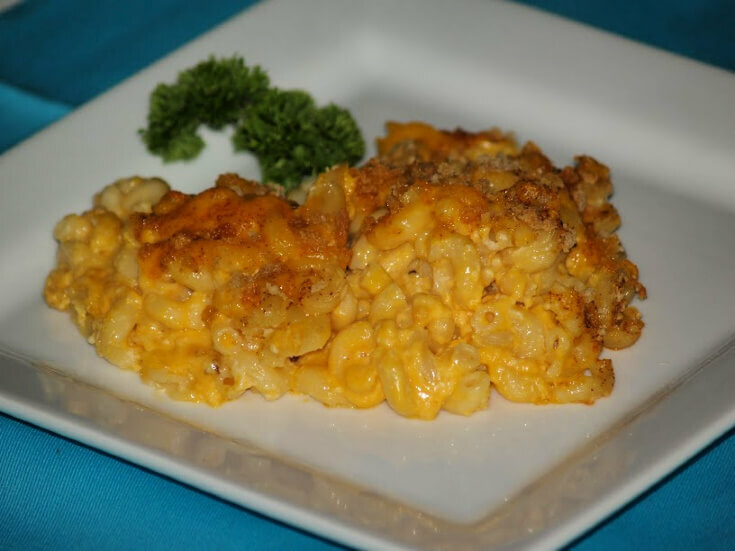 Learn how to make macaroni and cheese with this delicious recipe using a box of macaroni and cheese. Cook and prepare macaroni and cheese according to package directions. Brown the meat, pepper, celery and onion; cook until tender. Stir in corn, tomato paste, water, salt and black pepper. Combine meat mixture with the prepared macaroni and cheese. Blend mixture well; pour into greased 2 quart casserole baking dish. Bake for 15 to 20 minutes; serves 10. Learn how to make macaroni and cheese with a simple recipe. Place HALF of macaroni in buttered 1 ½ quart casserole dish. Sprinkle with 1 ½ CUPS of the cheese; top with HALF of the macaroni. PREPARE SAUCE by melting butter in medium saucepan; remove from heat. Blend in the flour; gradually stir in the milk and seasonings. Return to heat and bring to a simmer; stir and cook for 1 minute. 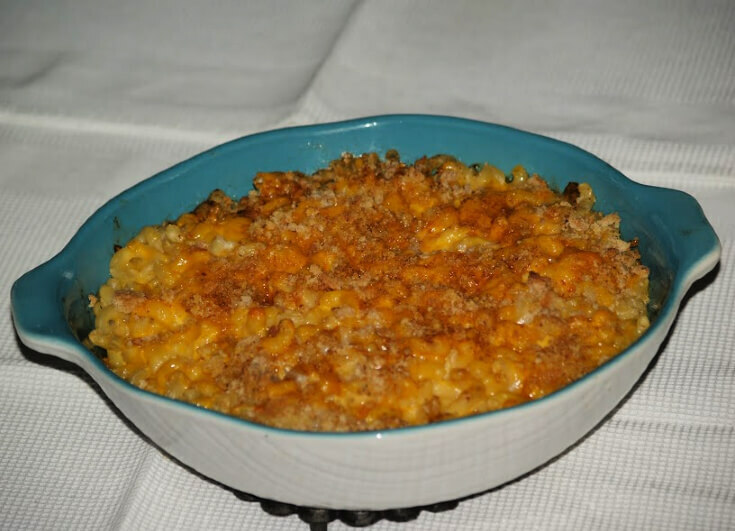 Pour sauce over the macaroni casserole; top with ½ CUP of cheese. Bake 15 to 20 minutes until cheese melts and slightly browned. Preheat oven to 350F degrees; butter a baking dish. Cut cheese in cubes; make layers of cooked macaroni and cheese in dish. Pour milk almost level with top layer; bake 45 minutes. NOTE: New York Cheddar is extra sharp and some has a slight smoky flavor. You can substitute with other Cheddar. Learn how to make macaroni and cheese with this creamy recipe made with Jarlsberg cheese. Preheat oven to 325F degrees; lightly grease 7X11 baking dish. Cook macaroni until tender; drained, rinse with cold water and drain well. Combine the macaroni, cheese, sour cream, mayonnaise and onion. Spoon into prepared baking dish; sprinkle top with crushed crackers. Bake 30 to 35 minutes; serves 6 to 8. Preheat oven to 350F degrees; butter 9X13 inch baking pan. Bring water and salt to a boil; add macaroni and boil 10 minutes. Drain macaroni, rinse with cold water and drain. Pour melted butter over the macaroni; set aside. Brown meat and onions in a large skillet. Add tomato paste, wine, ¼ cup water, salt, pepper and cinnamon. Simmer mixture about 10 minutes. Measure out 2 TABLESPOONS of the grated cheese; reserve for topping. Toss REMAINING cheese and beaten egg together with the macaroni. Mix macaroni and meat mixture together; spread in bottom of pan. FOR SAUCE combine butter, milk and cornstarch in medium saucepan. Cook and stir over low heat until thickened about 15 minutes. Stir in salt and remove from heat; cool slightly. Beat eggs until well blended; blend into the sauce. Pour the sauce over the macaroni mixture in baking dish. Sprinkle top with reserved grated cheese. Make 4 layers of filo sheets to fit on top of casserole dish. NOTE: Spread each layer with melted butter; score top in serving size. Learn how to make macaroni and cheese with canned cheese soup. Pour macaroni into 6X10 inch baking dish. Stir into the macaroni the soup, milk and Worcestershire. Slice frankfurters crosswise and arrange on top of macaroni. Bake 25 minutes until hot and bubbly; serves 4. Learn how to make macaroni and cheese with vegetables. Preheat oven to 350F degrees; lightly grease 11 inch baking dish. Cook macaroni in boiling salted water until tender; drain and set aside. Melt butter in large skillet; sauté onion, green pepper and onion until tender. FOR SAUCE melt butter in saucepan; stir in flour and salt. Gradually stir in the milk cooking until thickened. Remove from heat and stir in 2 ½ CUPS of the cheese. Combine the macaroni, vegetable mixture and the sauce together. Spoon into prepared baking dish; top with tomato slices. Sprinkle remaining ½ CUP of grated cheese; bake 30 minutes.